The rumored on again, off again talks between Michael Keaton and MCU are back in the news. Keaton is said to be in talks to play a villain in the new Spider Man: Homecoming movie set to be released in 2017. One of the rumor is that Keaton will be playing the part of the high flying Vulture, although nothing has been confirmed. I'm sure that speculators are going crazy. This is one comic that doesn't need any speculation to drive up it's values. 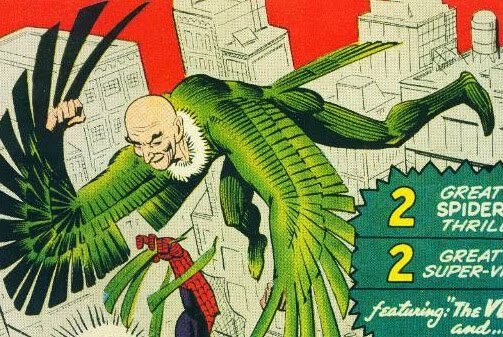 It's a very early Spider-Man appearance, third to be exact, and it has the first appearance of one of his most iconic foes. That alone drives up it's value. 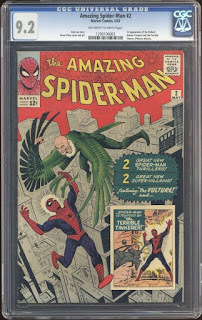 The Vulture is another creation of the power duo of the Silver Age, Stan Lee and Steve Ditko. 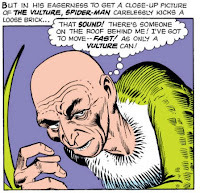 Before he was known as The Vulture, people knew him as Adrian Toomes. Toomes was somewhat of a genius and became an electrical engineer. He, along with a partner, opened up a small electronics firm. Eventually Toomes was swindled out of his share of the company and was left with nothing. He devoted his time to creating a pair of electromagnetic wings that would allow him to fly. After completing them, he discovered that exposure to the harness gave him super human strength. The next brilliant madman to make his first appearance in the pages of Amazing Spider-Man #2 is The Terrible Tinkerer. His given name is Phineas Mason, and he'ss kinda like a MacGuyver of the super-villain world. He can create weapons and machinery from the most basic of materials. He often sell his wares to other villains and crime bosses, but on an occasion or two, he'll take on a job of his own. Although he's not mentioned by name in this comic, Quentin Beck supposedly makes his first appearance in this book. Quentin Beck will become better known as the special effects and illusion master, Mysterio. He didn't originally start out appearing in this issue, but he was retconned to be part of The Terrible Tinkerers gang in an issue that was written sometime after his original first appearance in Amazing Spider-Man #13. Finding a graded copy for sale shouldn't be too hard to do. At the time of this writing, there are 1,454 copies registered in the CGC census. Finding a high grade copy will prove to be a little bit harder. There is one copy graded at a very high Universal 9.8, and three for Universal 9.6 NM+ copies. I have no idea whether any of these copies have gone up for sale or not, since I can't find any sales data for them. They will probably cost you an arm and a leg though. 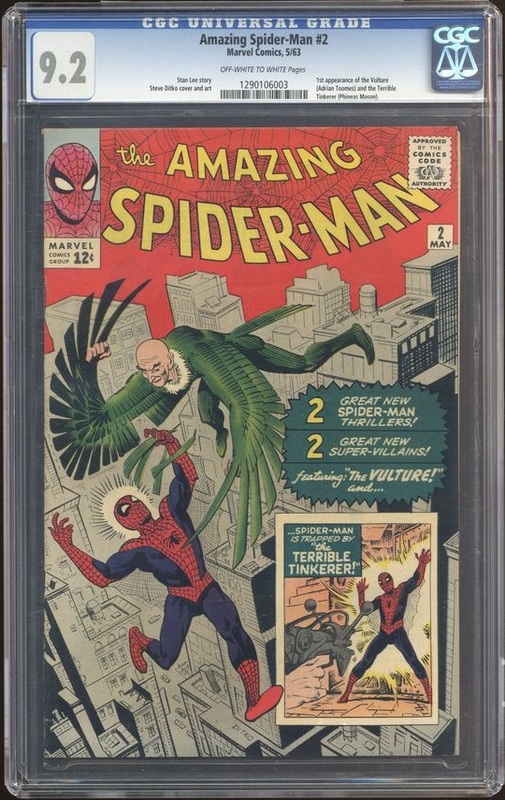 As for sales data I could find, the latest CGC graded 9.0 VF/NM copy sold last Nov. for $5,000, which was significantly less that the previous sale before that, which was $6,400. If those numbers are out of your price range, like they are for me, then have no fear. There are a fairly abundant amount of lower grade copies to choose from. If you're looking for something in the under $1,000 range, you'll probably have to start looking at 5.0 VF/F copies. The last sale for a copy at that grade went for $940 in April. Anything less than $500 and you're looking at a very low grade 1.8 G- to a 2.0 G.
Whatever grade you decide to get, or that your budget will allow, this is a good investment comic to get, regardless of any kind of movie announcement hype or big screen appearance. This is a very early Spider-Man appearance and the first appearances of one very popular Spidey villain, and one not as popular. If you have this one on your want list like I do, then I wish you luck on your hunt.